At Play More Music™, we feel performance is an important part of our students’ education, helping them develop confidence in their abilities and the composure necessary for public performance. 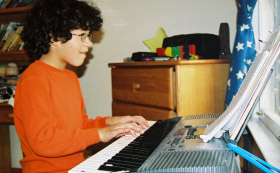 Several recitals are held each year and all students are strongly encouraged to perform. Information on scheduled recitals will be available here. Please join us to support the entire Play More Music™ family in our semi-annual studio recitals. Students of any age and ability are encouraged to perform a piece. Friends and family are always welcome in the audience. Please remain for the full 45-min recital as courtesy to all performers. We will celebrate with a reception after each performance. CLICK HERE to sign up for a time of your choice at the upcoming recital. Click here to learn about our summer options and to sign-up today! The PDF documents found here contain the complete studio policies, including important information about tuition payments, cancellation policy, and make-up lessons. To make a payment online, please click here. Please remember to contact Melissa first so she can discuss payment options. Online transactions will need to add a 3.5% surcharge.